NFWI-Wales has launched a new competition for members to enter as part of its Not in my Name campaign. Established in 2012, Not in my Name aims to end Violence Against Women (VAW) by raising awareness and recruiting male ambassadors to make a pledge never to commit, excuse or remain silent about male VAW. Please do not hesitate to contact the NFWI-Wales Office should you require further information. DFWI RESOLUTION CHALLENGE 2019 - 2020. 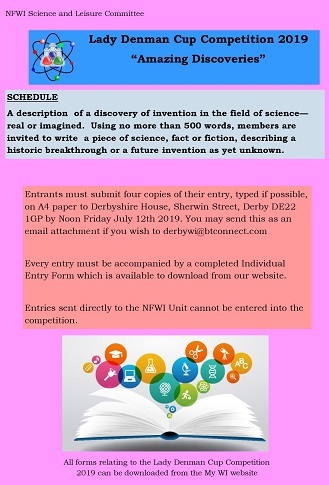 Click here for information and application form. Click here for essential information on litter picking element of the challenge. PLEASE MAKE SURE THEY ARE CLEAR AND SHARP FOR REPRODUCTION. DO NOT WRITE ON THE BACK OF THE PHOTO. 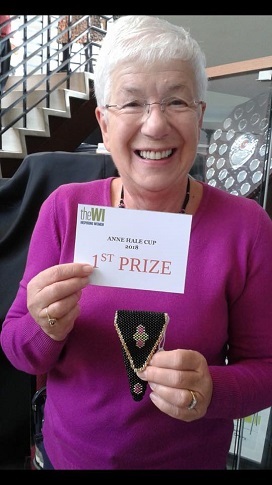 Anne Wright from Breaston Belles WI represented DFWI in the recent Huxley Cup competition. 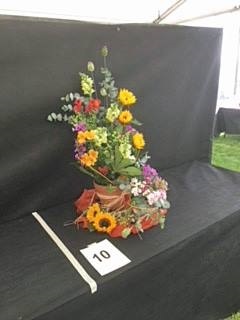 She didn't win, but her arrangement was nonetheless stunning.